First produced by Case in the early part of the 20th century, the Humpback Whittler was reintroduced to the Case lineup in 2009. The Humpback Whittler pattern is one of Case's oldest, but the new version includes several important improvements. Overall, the handle shape and blade pattern are much the same as the original knife, but steel and handle materials have both seen major upgrades. 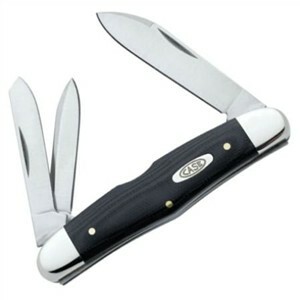 In all Humpback Whittler knives today, the blades are Case's Tru-Sharp alloy of high carbon stainless steel. Case makes today's Humpback Whittler with several types of handle slabs, but the black G-10 used here ranks as one of the best. G-10 resembles micarta, but the "wood-grain" pattern of G-10 comes from layers of tough fiberglass instead of paper or cotton. That makes an already good handle even more resistant to temperature changes, abrasion, and chemical damage. Only 3-5/8 inches long when closed, the Humpback fits in the pocket without unusual wear and tear, largely due to the rounded shape of the nickel silver bolsters. Improved thumbnail notches in the slip joint blades make blade access even simpler. Each blade is controlled by its own carbon steel spring bar but is only held, not locked, in the open position. The main spear point blade was designed for removing accurate shavings from wood, while the two smaller spey and pen blades originally had stranger purposes. Spey blades were often used for castrating farm animals, and pen blades transformed castoff turkey feathers into writing pens. For another collectible knife from Case, see the Case Russlock with Amber Bone Handle.